This is a selection of dubbing they we offer by Hends. Each are unique in their own way, and worth taking a look at. These dubbing are great for giving a lot of color selection without taking up space. All packages are the same weight as every other dubbing, except they come in a 2x3 bag. Hends Czech nymph dubbing is blend of different natural hairs. 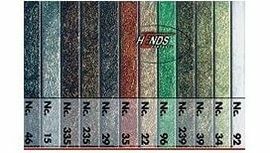 Mixed together for the most natural looking dubbing, with a large color range to go with it. 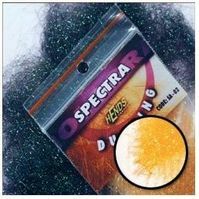 Spectra dubbing is a mid size and soft flash dubbing. The color selection of this dubbing is unmatched by any other flash dubbing on the market. 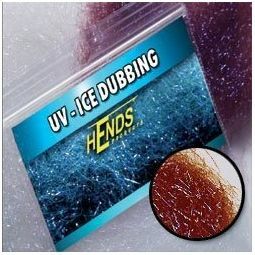 Coming in at 58 different colors, you have endless possibilities in your fly tying. Hends UV Ice dubbing is not your average ice dub. This is a super fine ice dubbing. Making it perfect for your small flies where you want to add some flair. Listed here are all of the dubbing dispensers. Each dubbing we carry has a couple to select from for your travel bag.